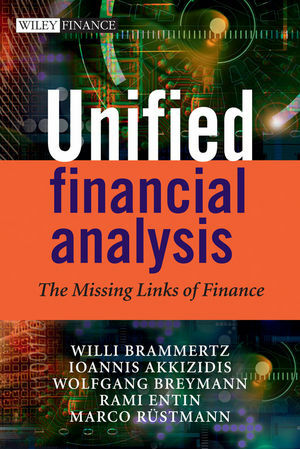 Unified Financial Analysis arrives at the right time, in the midst of the current financial crisis where the call for better and more efficient financial control cannot be overstated. The book argues that from a technical perspective, there is no need for more, but for better and more efficiently organized information. The title demonstrates that it is possible with a single but well organized set of information and algorithms to derive all types of financial analysis. This reaches far beyond classical risk and return or profitability management, spanning all risk categories, all valuation techniques (local GAAP, IFRS, full mark-to-market and so on) and static, historic and dynamic analysis, just to name the most important dimensions. The dedication of a complete section to dynamic analysis, which is based on a going concern view, is unique, contrasting with the static, liquidation-based view prevalent today in banks. The commonly applied arbitrage-free paradigm, which is too narrow, is expanded to real world market models. The title starts with a brief history of the evolution of financial analysis to create the current industry structure, with the organisation of many banks following a strict silo structure, and finishes with suggestions for the way forward from the current financial turmoil. Throughout the book, the authors advocate the adoption of a 'unified financial language' that could also be the basis for a new regulatory approach. They argue that such a language is indispensable, if the next regulatory wave – which is surely to come – should not end in an expensive regulatory chaos. Unified Financial Analysis will be of value to CEOs and CFOs in banking and insurance, risk and asset and liability managers, regulators and compliance officers, students of Finance or Economics, or anyone with a stake in the finance industry. Willi Brammertz (Zurich, Switzerland) has worked for 20 years in the field of financial analysis. He is founding partner of IRIS, now part of FRS Global, and father of one of the world’s leading financial analysis systems riskpro™. This system now runs in more than 200 banks in about 20 countries. Ioannis Akkizidis (Zurich, Switzerland) is Financial Risk Management Consultant and Analyst for IRI S integrated risk management. Wolfgang Breymann (Zurich, Switzerland) is Professor for Financial Mathematics at the Zurich University of Applied Science Winterthur. Ram Entin (Zurich, Switzerland) is Financial Risk Management Consultant and Analyst for IRIS integrated risk management. 1. The Evolution of Financial Analysis. 1.3 Departments, silos and analysis. 1.4 The IT system landscape. 1.6 Hazards of a single solution. 2.1 The notion of elements. 2.2 Elements of financial analysis. 2.4 Financial events and expected cash flows. 2.5 Risk factors and risk categories. 2.9 The methodology as an image. 3.1 Modeling of financial contracts. 3.3 Rules and mechanisms of standard contracts. 4.3 Stochastic market models: the arbitrage-free world. 4.4 Stochastic market models: the real world. 5.1 Exposure, rating and probabilities of default. 5.2 Data determining gross exposure. 5.4 Credit line and limits. 6.1 Risk sources and behavior. 6.5 Sequence of behavioral effects. 7.1 Introduction to cost accounting. 7.2 Allocating costs to financial contracts. 7.3 Integration of costs into the general framework. PART III: ANALYSIS - LIQUIDATION VIEW. 8. Financial Events and Liquidity. 9. Value, Income and FTP. 10.1 Challenges of sensitivity calculation. 10.2 Interest rate sensitivities from events. 11.5 Stress and shock scenarios. 11.A.3 Intraday and parallel histories. 12.1 Basic indicator and standardized approach. 12.2 Statistical basis of the advanced measurement approach. 12.3 Operational value at risk. PART IV: ANALYSIS - GOING-CONCERN VIEW. 13.1 Market conditions and general risk factors. 13.A.1 Single contract level and performance. 14.1 Chart of accounts and portfolio structures. 14.2 Forecasting volume and characteristics. 14.3 Adding market forecast, counterparty information and behavior. 16.4 Forecasting new volume and characteristics. 17.1 Financial and nonfinancial corporates. PART V: OUTLOOK AND CONCLUSIONS. 18.1 Risk and performance measurements. 18.2 Example of an economic risk report. 19. Towards a Unified Financial Language. 19.1 The need for a unified financial language. 19.2 Structure of a unified financial language. 19.3 New finance, new regulation.